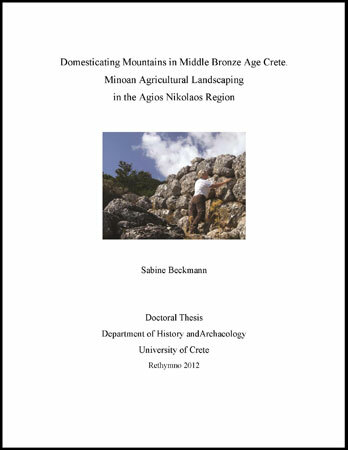 Over 300 dwelling sites in the mountains of north-east Crete (Agios Nikolaos), datable (by surface pottery and lithics) mainly to the Middle Bronze Age (the Minoan Protopalatial period, ca. 2000-1650 BCE) were discovered and studied. Sites were isolated but not more than 300 m (average) apart from each other and interconnected with a network of paths. Most ruin foundations were built with massive block masonry (named “oncolithic” in this study), while long enclosure-walls claimed areas of several thousand square meters (up to 6 hectares) for each habitation, including arable and rocky land. The setting and massive construction of these enclosures, (originally more than a meter high and with a total length of ca 150 km), show that they belonged to the sites. These features were mapped with GPS and used for the GIS study of land use and topography. Archaeologists in the past believed a few of the then known sites (ca. 5, while enclosures and connecting paths were unknown) situated on the old roads, to have been defensible forts or watch-towers because of their so-called “monumental” or “Cyclopean” masonry, but this study shows that the massive settlement including landscape opening (landnam) and structuring (covering an area of ca. 30 sqkm min.) must have been used for mixed agriculture/animal husbandry. The area has been re-used by mixed agriculture (emphasis on pastoral economy) from the second half of the 19th century. Data gained from ethnoarchaeological study are used to corroborate and classify archaeological findings.